Katharine loves animals — all sorts — big, little, pawed, hoofed, furry, feathered, even (ack!) scaly! So she includes them in many of her stories. There are horses in all of her historical romances (that’s how lots of folks got around back then), but horses appear as special characters in I Loved a Rogue and My Lady, My Lord. Dogs are central to the stories in The Pirate & I and I Adored a Lord, and the hero of When a Scot Loves a Lady has two magnificent wolfhounds. One of Katharine’s beloved road trip romances, How a Lady Weds a Rogue, is positively full of critters with a stolen horse, a three-legged dog, and a helpful dairy cow. A mysterious (yet cuddly) cat stars in Again, My Lord, and a rambunctious piglet plays a special role in The Prince. Have you read Katharine’s novel that features a monkey? Welcome to my Holiday Cookie Exchange Hop recipe! After years of living in danger, the exiled royal of my historical romance The Prince truly enjoys the simple, cozy task of preparing tea. He especially loves making tea for the young woman living in his Edinburgh home and scandalously pretending to be a young man so that she can study medicine. To honor these two lovers, I’m offering a delicious holiday cookie that pairs perfectly with tea. Bonus: it’s wheat free! SPOILER ALERT: This wonderful piece, written by the reviewer Janga after the publication of the final book in the Falcon Club Series, contains plentiful spoilers. In When a Scot Loves a Lady, the first book in Katharine Ashe’s Falcon Club series, the hero, Leam Blackwood, says to the heroine Kitty Savege at their first meeting, “But things be not always whit thay seem.” That statement, which Kitty understands all too well and later repeats to herself, introduces a theme that is woven through the Falcon Club books, the original trio of novels and the two books in Ashe’s current Devil’s Duke series. Neither Leam nor Kitty is what they seem to be, and this will hold true for the protagonists of the four novels that follow as identities shift and meld and emerge. The theme reaches its richest complexity in The Earl, Ashe’s most recent novel. 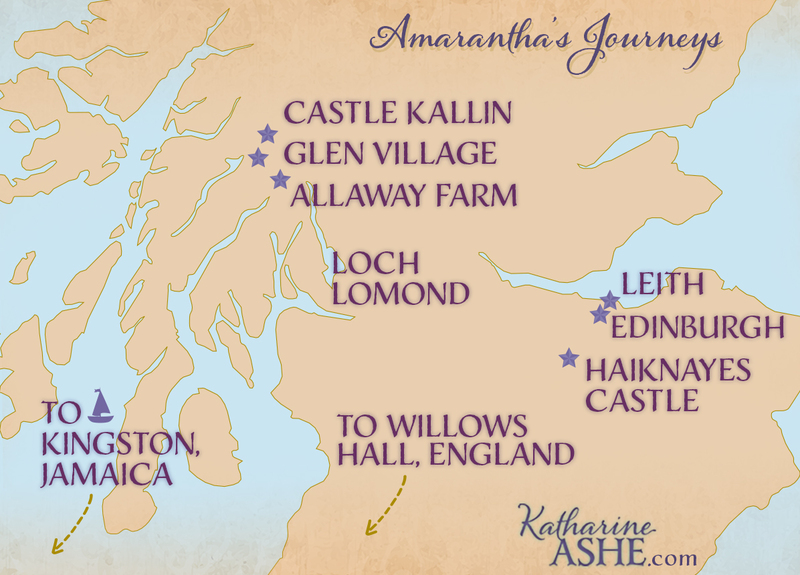 In The Duke, Amarantha travels a lot! Here are the most significant stops on her journeys in Scotland, and along Gabriel’s travels as well. This map also includes Loch Lomond, the left bank of which Lady Justice and Peregrine traverse in The Earl. Many thanks to Mary Brophy Marcus for the fabulous idea and design concept for this map, and to Jenn Zapf of Waxcreative Designs for the gorgeous execution of it.